It seems like anytime something exciting happens in the world of cycling, it’s got something to do with drugs. Like I said, it seems like anytime something is happening in the world of cycling it’s got something to do with drugs – and right now is no different. According to ESPN, former Tour de France winner Floyd Landis has been speaking with the US Anti-Doping Agency, giving them some in-depth information on how cyclists get around the hassles of constant drug testing during competitions. The UCI, Cycling’s international governing body, uses something called the “biological passport analysis system” which sounds a lot cooler than it is – basically it’s just a record of all of your tests used to track abnormalities. Rather than test for specific banned substances, it looks at your body’s levels and watches for spikes and drops of certain things. Landis, who had his Tour de France win taken away after a positive test, says teams with enough resources have known for years how to get around the passport system. He says some members of his team strategically timed when they took a certain performance enhancer in the lead up to his ’06 win and were able to do so because his team usually had advance notice of when the “random” drug tests were going to be. Looks like Landis is the Jose Canseco of the cycling world, but lets not forget – Canseco was right about a lot more than people will give him credit for. Reading this made me think of an article I saw earlier this month where the World Anti-Doping Agency was getting on the NHL about not testing players enough. WADA says the fact that the NHL only tests during the regular season and not the playoffs or the summer is disappointing, adding that they’ll be trying to get the league to be “code compliant” as soon as possible. I’m sure it’ll be an issue when the league and the Players Association have to try and crank out another collective bargaining agreement in a year or two (God help us). I hate to say it, but if we’re seeing athletes in every sport from cycling to baseball to football using performance enhancing drugs of one kind or another – what makes it so unbelievable that it’s happening in hockey too? Do you think there are players in the NHL that would fail drug tests if WADA got the league to up its testing policies? Leave me a comment and let me know how you feel! 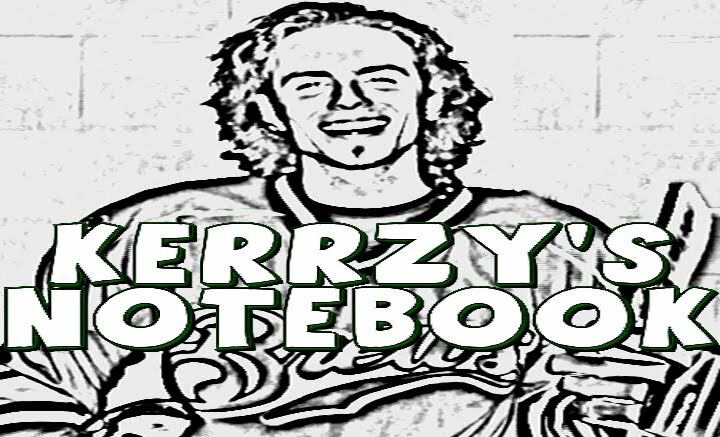 Kerrzy’s Notebook: Not So Saintly?